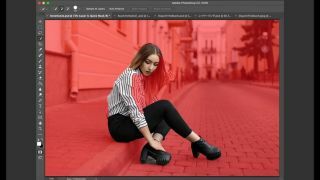 Adobe has recently teased a few upcoming features of Photoshop CC, but this latest demonstration is one of the most exciting yet. It’s called Select Subject, and, well ... it’s what it sounds like. Powered by Adobe Sensei, the new tool uses machine learning to recognise objects and people in photos, allowing users to select their subject with a single click. Users of Photoshop know that cutting a subject out of a background can still be a protracted nightmare, especially if there are fine details or when contrast n the image is low. Select Subject promises to fix the issue, and if it works the way Adobe is promising, it’s shaping up to be a massive timesaver. Thanks to the artificial intelligence of Adobe Sensei, which uses the trillions of data points gathered by Adobe over the years, this feature should even be able to work with images that contain multiple subjects or complex details. This is one of a number of new Photoshop CC features that Adobe has been teasing over the last few months. At the recent Adobe MAX 2017 conference, the firm showed off Project Scribbler, which uses Adobe Sensei to learn how to correctly colourise black-and-white images, or even turn basic line sketches into fully realised images. There was also Deep Fill, a significantly improved version of Content Aware Fill that can intelligently guess what’s behind the object you’re trying to remove from an image. We also got a tantalising peek at Adobe Cloak, which provides a similar service but for video editing, allowing for automatic removal of intrusive objects or people in a shot. Other teased tools included Scene Stitch, a content-aware fill tool that searches other image libraries for appropriate material to use in an image, as well as additional tools designed to help with the creation of VR and 360 videos. Head to the Adobe blog to see a full selection of the upcoming highlights. Most of these are still very much in the experimental stage, but the good news is that Select Subject is confirmed to be included in an upcoming update to Photoshop CC.